This review is a part of book blog event in celebration of 50th anniversary of Penguin Modern Classics. To mark the anniversary Penguin is launching a brand new series: The Mini Moderns – a collection of outstanding short-stories and novellas in convenient, pocket-sized and pocket-money priced editions. Curious Book Fans are contributing with the reviews of Youth by Joseph Conrad and La Grosse Fifi by Jean Rhys. You can read more about the Penguin Mini Moderns and book blogging event here. The sleek, stylish design chosen for Penguin Mini Modern Classics is perfect for Jean Rhys’s ‘La Grosse Fifi’ and other stories. Within a few lines I was transported to another place and time – in the case of the title story it’s the south of France just after the end of the First World War; the silver cover of the book seemed to me like an extravagant novelty to have sticking out of a glamorous evening bag carried on a night at the casino, or thrown casually on the seat of a gleaming Bugatti while driving down to Cannes. Quite simply, the packaging fits this little gem! Although not the longest of the four stories featured here, ‘La Grosse Fifi’ is certainly the most memorable. The story is told from the point of view of Roseau, a young woman who certainly appears to be more of a hanger-on at the edge of the in-crowd, than one of the wealthy expats who are there to be seen. Staying in the same hotel as Roseau is Fifi, a generously built, ageing woman with an apparently voracious sexual appetite satisfied by a handsome young man who is happy enough to fulfill her demands in return for Fifi’s lucrative patronage. Roseau already raises eyebrows among her circle of acquaintances simply by staying in a hotel they think is inferior, but she risks isolation when she objects to the cruel comments they make about Fifi. The more withdrawn Roseau becomes, the louder and more brash Fifi appears to grow but, to Roseau’s surprise, she finds in the older woman a remarkable ally. The longest story, “Vienne”, is deliciously dark and has a hint of ’Cabaret’ about it; the narrator Francine leads us through interwar Vienna by way of its dimly lit night clubs where disinterested Japanese business men lavish money on a string of obedient, hollow-eyed young dancers. Francine’s life is an endless whirl of restaurants and night spots but her comfortable life threatens to come crashing down when, during a trip to Budapest, her husband, Pierre, makes a shocking confession. Again Rhys presents a cast of characters that are at once repugnant but compelling. Similarly, her depiction of interwar Europe is effortlessly glamorous yet simultaneously seedy. ‘Mixing Cocktails’ is a fleeting evocation of a gloriously languid summer’s day somewhere in the Caribbean, no doubt inspired by the author’s own childhood in Dominica, while ‘Tea with an Artist’ takes us to the Paris atelier of an artist who refuses to sell any of his paintings. The former is hardly more than wonderful setting of a scene yet, it is quite magical and highly evocative. Until I spotted this Penguin Mini Modern Classic I had no idea that there was any other published work by Jean Rhys; I’d always assumed that her 1966 novel “Wide Sargasso Sea” was her only notable literary work and hadn’t thought of looking for more. It’s great source of pleasure, then, to find this collection of some of Jean’s short stories; to read them is to be truly transported to another place and time and to spend an hour in the company of this colourful cast is something of guilty pleasure. 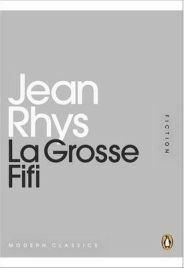 2 Comments on "La Grosse Fifi"
Wide Sargasso Sea is my favourite, but Jean Rhys wrote several other novels and a couple of collections of short stories – I really should reread. A biography of her was serialised on the radio a little while ago (perhaps in 2009 when I was off).